Findings were published in this month’s American Journal of Sports Medicine studying “incidence, risk factors, and characteristics of knockouts (KOs) and technical knockouts (TKOs) from repetitive strikes in professional MMA“. The study focused specifically on UFC’s pay per view cards. The study concludes that “Rates of KOs and TKOs in MMA are higher than previously reported rates in other combative and contact sports.”. The study also notes the statistical risk factors making brain injuries more likely as “weight class, earlier time in a round, earlier round in a match, and older age“. Background: Mixed martial arts (MMA) is a full combative sport with a recent global increase in popularity despite significant scrutiny from medical associations. To date, the empirical research of the risk of head injuries associated with this sport is limited. Youth and amateur participation is growing, warranting investigation into the burden and mechanism of injuries associated with this sport. Purpose: (1) To determine the incidence, risk factors, and characteristics of knockouts (KOs) and technical knockouts (TKOs) from repetitive strikes in professional MMA; and (2) to identify the mechanisms of head trauma and the situational factors that lead to KOs and TKOs secondary to repetitive strikes through video analysis. Methods: Competition data and video records for all KOs and TKOs from numbered Ultimate Fighting Championship MMA events (n = 844) between 2006 to 2012. Analyses included (1) multivariate logistic regression to investigate factors associated with an increased risk of sustaining a KO or TKO secondary to repetitive strikes and (2) video analysis of all KOs and TKOs secondary to repetitive strikes with descriptive statistics. Results: During the study period, the KO rate was 6.4 per 100 athlete-exposures (AEs) (12.7% of matches), and the rate of TKOs secondary to repetitive strikes was 9.5 per 100 AEs (19.1% of matches), for a combined incidence of match-ending head trauma of 15.9 per 100 AEs (31.9% of matches). Logistic regression identified that weight class, earlier time in a round, earlier round in a match, and older age were risk factors for both KOs and TKOs secondary to repetitive strikes. Match significance and previously sustained KOs or TKOs were also risk factors for KOs. Video analysis identified that all KOs were the result of direct impact to the head, most frequently a strike to the mandibular region (53.9%). The average time between the KO-strike and match stoppage was 3.5 seconds (range, 0-20 seconds), with losers sustaining an average of 2.6 additional strikes (range, 0-20 strikes) to the head. For TKOs secondary to strikes, in the 30-second interval immediately preceding match stoppage, losers sustained, on average, 18.5 strikes (range, 5-46 strikes), with 92.3% of these being strikes to the head. Although I have a tremendous amount of respect for my University of Toronto colleagues, I respectfully disagree with some of their conclusions and suggestions. I find their observations regarding older fighters and knockout/TKO history being significant risk factors extremely interesting. Also, 17 blows to the head, on average, before a TKO being called seems like a lot of punishment when you put it on paper! Unfortunately, like me (in my earlier days) they took the bait and stepped into the pointless “Which is more dangerous?” debate. It reminds me of the thin vs. thick crust or Pat’s vs. Geno’s cheesesteaks debates. The far more important and medically relevant question that unfortunately went unaddressed is, are combat sports following current concussion management guidelines and protocols, and the latest research regarding enhanced player safety? The clear answer is, not even close! Their basic conclusion that MMA is more dangerous than these other contact sports does not consider the importance of the accumulation of damage over time due to sub-concussive blows. Research clearly suggests that far more important than the highlight-reel stoppages, it’s the hundreds or thousands of routine head strikes that do the real damage over time. Therefore, drawing your conclusion from accumulation of head strikes over time is far more likely to be predictive and useful than mere stoppages. I believe that 10-second counts potentially subject an injured athlete to additional unnecessary head trauma. If a fighter is so injured that he needs 10 seconds to shake it off or gain his composure, the fight should be stopped. The NFL experience shows that it takes a sideline concussion expert roughly seven to nine minutes to properly evaluate a potentially concussed athlete. Therefore, a 10-second count/assessment/evaluation is meaningless and probably dangerous. Greater referee training regarding concussions is a must! 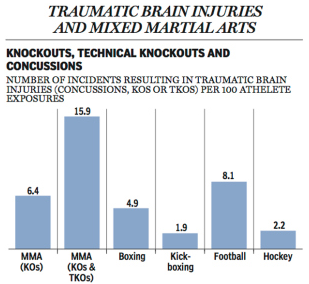 The more I learn about mTBI, the more I believe that sustaining repeated blows to the developing brain (specifically kids younger than 14) regardless of the activity or sport (tackle football, soccer headers, girls lacrosse without helmets, amateur boxing, full-contact martial arts, etc.) is not a good idea. This paper is a good step to further the conversation and encourage stakeholders in combat sports to aggressively address the mTBI elephant in the room.